As a crisis of potential voter suppression in Georgia deepened, the Democratic candidate for governor accused her opponent of seeking to disenfranchise people of color and women by creating a "miasma of fear" around voting. Stacey Abrams, who if elected would become the first African American woman governor of any state, is running against Georgia's Republican secretary of state, Brian Kemp. A lawsuit filed by civil rights groups on Thursday accused Kemp of seeking to disenfranchise more than 50,000 voters, up to 80% of them minority voters, by suspending voters from registration rolls if records held by various state agencies show any slight discrepancy in how a voter's name is hyphenated, spelled or spaced. Any voter whose records betrayed such a discrepancy would not be unregistered but would have to take subjective steps to convince poll workers of his or her identity, thereby risking not having his or her vote counted. As secretary of state, Kemp is responsible for administering elections laws - including, in this case, regarding his own election. Appearing on CNN's State of the Union, Abrams repeated a call for Kemp to resign as secretary of state. Kemp's enforcement of the so-called "exact match" law, passed last year by Georgia's Republican-led legislature and signed by Republican governor Nathan Deal, would hit minority voters hardest, she said. "What about those low-propensity voters in those tiny communities who are finally stepping up and saying, 'This is my turn to cast my ballot,' only to find out that they are disenfranchised?" Abrams said. "They don't know that they can go to the polls. They get a confusing letter saying there is something wrong with their registration, and more than likely they will sit out this election. "The miasma of fear that is created through voter suppression is as much about terrifying people about trying to vote as it is about blocking their ability to do so." The margin in the last two Georgia gubernatorial races has been about 200,000 votes. An Associated Press investigation found that Kemp's office had cancelled more than 1.4m voter registrations since 2012, including nearly 670,000 in 2017 alone. Georgia's population is approximately 32% black, according to the US Census. The list of voter registrations on hold with Kemp's office is nearly 70% black, the AP reported. Kemp's office has rejected concerns about disenfranchisement from the exact match law. Kemp has accused a 2013 voter registration project led by Abrams of sloppiness in registering voters and a failure to "adequately train canvassers to ensure legible, complete forms". As minority leader in the Georgia House of Representatives, Abrams led a lawsuit against Kemp in 2016 challenging the exact match voting regulation, which was not state law at the time. A federal judge ruled Kemp improperly cancelled 33,000 voter registrations. Abrams said on Sunday Kemp "knew" the exact match system would lead to disenfranchisement. 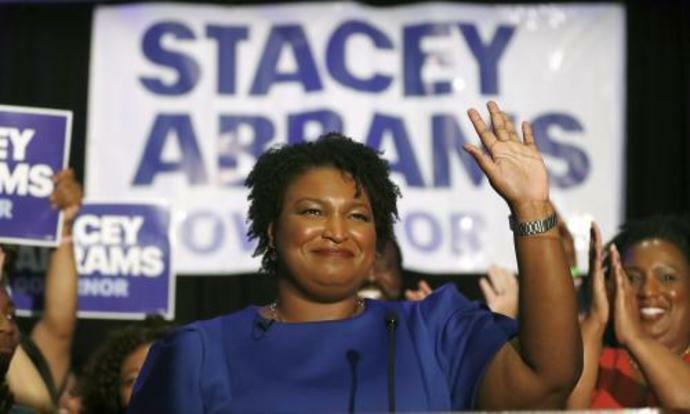 "I would say that we have known since 2016 that the exact match system has a disproportionate effect on people of color and on women," Abrams said. "He was sued for this exact problem. "He was forced to restore 33,000 illegally canceled registrations. And he turned around and got the state legislature to pass a law to allow him to make the same mistake again. "When you know that what you are doing is going to have a disproportionate effect on people of color and on women and you do it anyway, that erodes the public trust in the system, and that's problematic." CNN said Kemp turned down an invitation to appear on the show. He commented via Twitter, writing that Abrams was "unapologetically extreme" and "banking on illegal immigrants to secure victory for her at the ballot box". As context he attached a Fox & Friends clip in which Abrams is seen to include "documented and undocumented" people in a list of sections of Democratic support. The issue also pulled in another senior Georgia Republican, when it was reported that David Purdue briefly seized a phone from a student who tried to ask a question about voting laws while the senator campaigned for Kemp. Alyssa Milano's call to boycott Georgia has not found support by studios, which rely on the state's unique and valuable tax incentives.